Untying Myself – Hello Korea ! 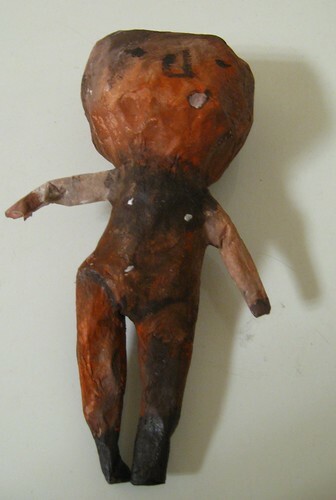 Jeong-Ae gave me this little paper mache doll. I’m supposed to amass a trash bag full of little naked orphans as one portion of our puppet play in Andong next month. This little lovable, flawed, raw, evocative, evolving creature made of ashes and blood – molded in Jeong-Ae’s hands in a few minutes could never have been born from my mind; my regulated, shackled, censored mind. For some reason, the word “sing” comes up in conversation, and I tell Mr. S. that birds sing. He tells me that in Korea bird don’t sing, they cry. Birds cry. Animals cry. People cry. All living things in Korea share han. They all cry. Jeong-Ae reaches out and clasps me and Jane’s hands. She tells us that because she has suffered, she can spread happiness. We must all promise, yaksok, to spread happiness. Mr. S. and I hold hands. One bird is crying, one is singing. He doesn’t want to make me cry. So sing, I tell him. Sing.